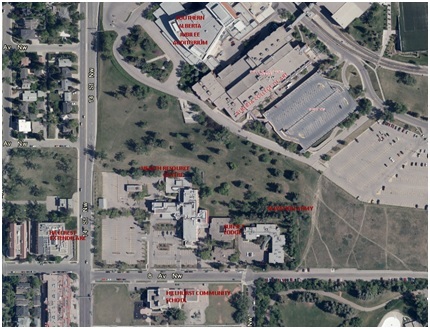 A development permit and land use amendment application for a mixed use health care campus and multi-residential for the Grace Hospital site at the corner of 14th Street and 8th Avenue NW. This application proposes to change the designation of the Grace Hospital, Sunset Lodge and the Agape Hospice located at 1302, 1340 and 1402 8 Avenue NW, and 1040 14 Street NW from M-CGd72 District, S-CI District, and Direct Control District to Direct Control District to accommodate a mixed use health care campus and multi-residential development. The maximum building height for other areas on the site is proposed to be 70 metres. You can view a summary of feedback and verbatim comments from June 2017 in this What We Heard Report. This isn't the final decision. City staff review the proposal based on technical feasibility, City policies, stakeholder feedback (including public input), landowner rights and provide feedback to the applicant. Changes to the proposal will be negotiated based on The City's review of the proposal and feedback from the public. Bylaws and reports will then be prepared for City Council to approve in order for the development process to proceed. These bylaws and reports inform City Council and the Calgary Planning Commission of everything that would need to happen if they approve the application.